High pressure often brings settled conditions, but can also create notable temperature differences across regions with differing topography. This is largely due to temperature inversions - thin layers in the lower atmosphere where the temperature increases sharply with height, rather than the normal decrease as you move upwards. It forms a barrier to vertical motion, and traps cool moist air below the inversion with warm, dry air just above. These inversions can also trap layers of low cloud, mist and fog close to the ground, sometimes producing several days of "anticyclonic gloom" - they can also affect your TV and radio signals, as Jim Bacon explains. Over several days, inversions can also lead to a build-up of dust and pollutants, because often there is little wind to disperse these particles trapped near the ground. Under a large area of high pressure, air gradually sinks and therefore warms, creating an inversion. 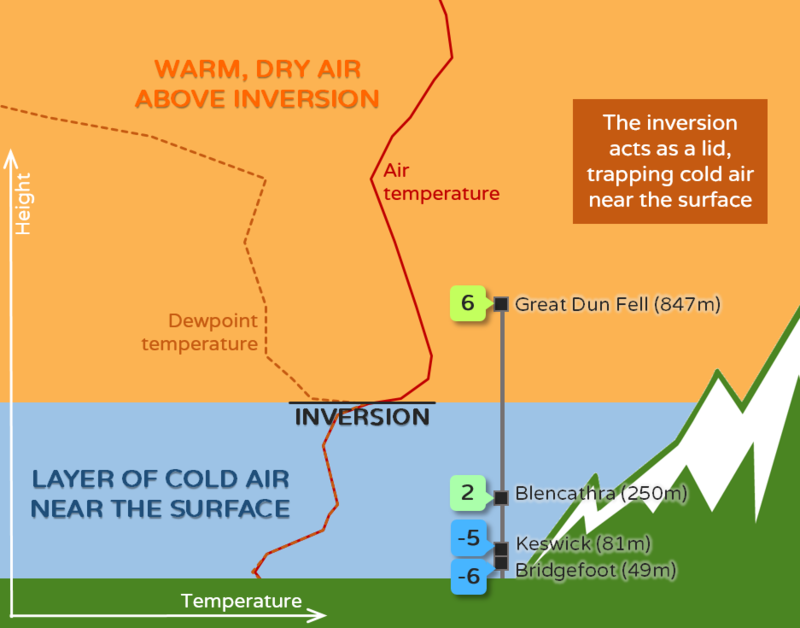 If the height of an inversion is low enough, sometimes the tops of hills or mountains will be above it, making them much warmer than the valleys or lowland areas within the cold, moist air that has been trapped beneath these inversions. After a long night of radiative cooling, many lowland sites across northwest England fell widely below freezing by morning. However, some high ground stations were reporting temperatures much warmer than their lower-elevation neighbours. This was due to a temperature inversion, which is clearly depicted on the midnight radiosonde ascent below (a plot of temperature and dewpoint change with height) from Castor Bay in Northern Ireland (fairly representative of the type of vertical profile that was over northwest England that morning). The temperature inversion is found where the temperature trace (red line) becomes flat / horizontal. The closer the temperature and dewpoint lines are on a radiosonde plot, the moister the air is - below the inversion both temperature and dewpoint traces are more-or-less identical, implying very moist (and cold) air trapped beneath the inversion. Aloft, there is a large gap between the temperature and dewpoint traces, depicting the much drier air found above the inversion. At 08:00 UTC, the temperature at Great Dun Fell (847m above sea level) was 5.7C. 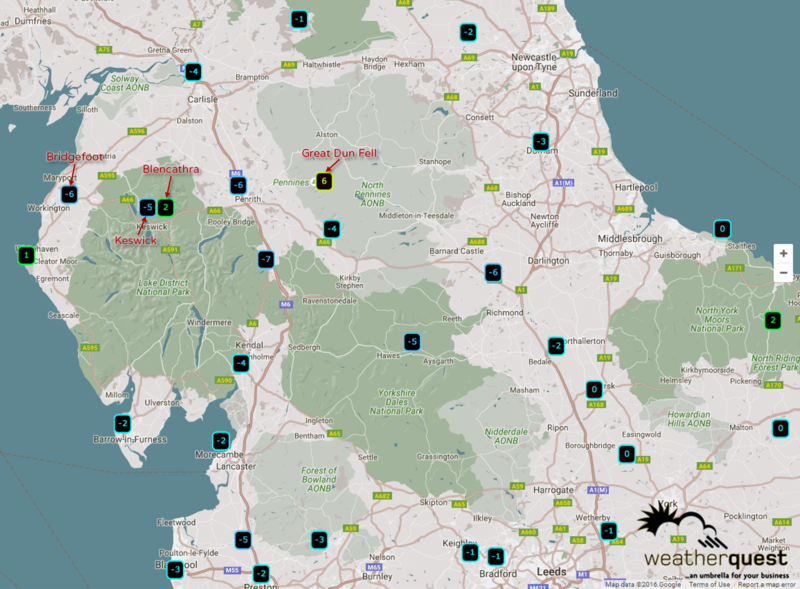 At the same time, Blencathra (249m above sea level, in Cumbria) reported a temperature of 1.6C. Yet just 5 miles away it was -4.5C at Keswick - why such a large difference over a short distance? 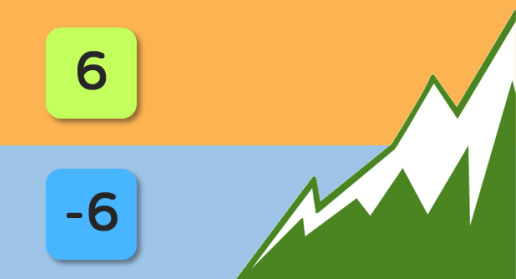 It's altitude, since the station at Keswick is only 81m above sea level. Usually the air gets colder as you go up through the atmosphere - but on this occasion it is clear that the reverse is true, highlighting the existence of a temperature inversion.